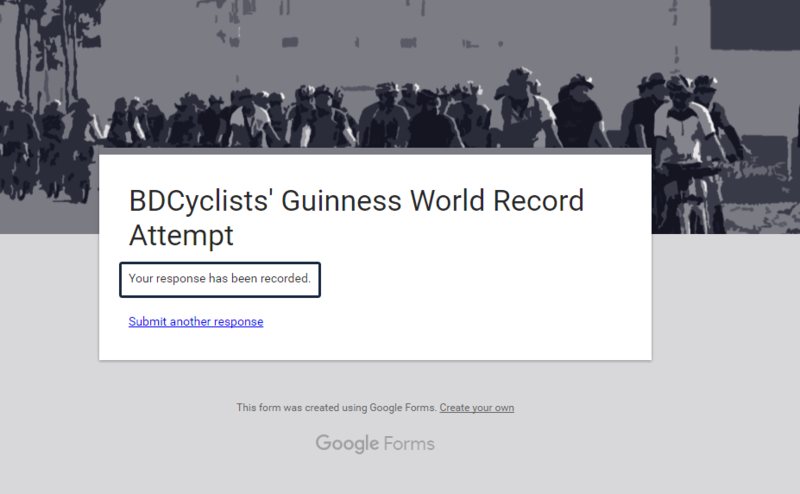 BDCyclists attempt Guinness World Record! The record "Longest single line of bicycles" was initiated by United States of America in 03 October 2010 with 914 cyclists and it was recognized by the Guinness World Record Team. After 5 years of the record, in 2015 Cyclist Federation of Bosnia and Herzegovina broke the record by riding 984 bicycles and currently holding it. Now it's time for us to try and for this, we need you to be part of the team! Let's ride. BDCyclists is a community based social network primarily based on Dhaka, Bangladesh has about 70,000 members and operated through a closed facebook group and a public page with few volutary admin(moderators) and activists. From the inception of this group the essence is spreaded way beyond the capital city and consequently footprint is getting larger with time. The instinct that drives BDCyclists, is to promote cycling in order to help ease pollution, traffic congestion in the city and maintaining a healthy lifestyle. BDCyclists' aim to convert 5% of the car owning crowd of Dhaka to cycle commuters and promote bicycling is a mode of everyday transport in the country. It is our immense pleasure to announce the attempt for breaking Guinness World Record of Longest single line of bicycles (moving) which will be held on 16th of December, 2016. This record is currently owned by Cyclist Federation of Bosnia and Herzegovina and before Bosnia, United States of America hold this record. BDCyclists would like to demonstrate people especially city dwellers that bicycle can easily meet the need for local commute. Adopting cycling for local commute will not only help to keep citizen healthy but also contribute to create positive global climate. 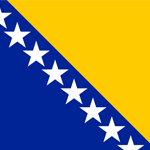 Existing Record: The record of longest single line bicycling (moving) was initially created by USA and recognized by Guinness World Record team.In 2015, Cyclist Federation of Bosnia and Herzegovinabroke the record by riding 984bicycle in an event organised during the Sarajevo Grand Prix in Sarajevo. Who Can Participate: Anyone who has a bicycle and a member of BDCyclists can participate into this record breaking attempt on 16th of December, 2016. Participant’s bicycle has to be in good condition and wearing helmet is compulsory. You can participate into the ride if you have experience riding into dhaka street, capable of maintaining single and able to ride at least 5 kilometre at a time without any break. We highly discourage newbie/new riders not to register for this attempt. Any bicycle except two wheels regular bicycle (i.e. Unicycle, Tandem bicycle) are not allowed. If you have any more questions, check the FAQ. Facebook Event Link: Click here to check the FaceBook Event. Press Release: You candownloadthe official press release from here. The longest single line of bicycles consisted of 916 cyclists in an event organized by the Independent Order of Odd Fellows, Lodge 169 (USA) in Davis, California, USA, on 3 October 2010. 1,148 people were at the start, but due to the length of the route, only 916 cyclists were able to be in the line at one time. The longest single line of moving bicycles consists of 984 cyclists in an event organised by the Cyclist Federation of Bosnia and Herzegovina during the Sarajevo Grand Prix in Sarajevo, Bosnia and Herzegovina, on 14 June 2015. 16th December, Victory Day of our precious Bangladesh. Can we, BDCyclists broke the record of the day of victory and make our cyclists, our Bangladesh proud? Our fingers are crossed, let's wish us the best. Bibs distribution will be begin at 11:00AM by volunteers from several booths. Participants are requested to line up their bicycle in a single line within the marked area. Volunteers will reach participant one by one, distribute bibs and assist in fixing. At 11:30AM, BDCyclists moderator/activists will brief the rules and regulations to participant so that everyone remains on the same boat. However, rules and regulations can also be found under FAQ tab. At 12:00PM, together we will start the record breaking ride from the starting mark and follow the single line till we touch finishing line. We are expecting to finish this ride smooth and sound. There is no specific timeline to wrap up the event. However, we will neither pace up nor slow down the movement. We will remain on the single line and not make significant gap. Once the last man crosses the finishing line, event marshal will officially declare the closing. Every registered members need to wear BIBs to participate in this trial/selection ride. Aren't you a member of BDCyclists yet? Is this event only for successfully registered cyclists? Yes but successfully registered bicyclists MUST participate scheduled rehearsal/selection ride on 9th December OR 13th of December, 2016 (Govt. Holiday). We will conduct a rigorous screening process and select cyclists who are fit for this event. This final list will be made based on the registration serials and participant’s performance for the main event. I forgot to register, what shall I do? Due to some limitation and guideline set by Guinness team, we cannot accommodate further cyclists other than who are successfully registered and passed the rehearsal/selection ride. I have done with registration but did not get any update. Now what? You will see a notification like this [click to view] once you have successfully completed the registration form. Also we will update this list -> List of final participants <- after the registration has ended. If you couldn't find yourself in the list, feel free to contact us. What are the dates of trial and rehearsal/selection ride? Trial/Selection Ride: 9th and 13th of December, 2016. We highly recommend to attend any of the trial/selectionride so that you understand the rules and regulations better. These/Selection ride will give you the confidence and help you to prepare for the main event. We all need to be synced properly so that our attempt do not go in vain. All participant must attend any of our rehearsal/section ride. Whoever you are or whatever your capabilities are, trial/section ride is MUST. Can I leave the event venue if first attempt become unsuccessful on 16th December? I could not register/attend trial/selection ride? Can I attend on behalf of my friend who got selected? I can come to main event on 16th December, 2016 but unable to attend on any trial/selection ride on 9th or 13th December, 2016. Can I join the main event? No, All registered participant must attend any of our rehearsal/selection ride to participate in the main event. Is there any registration fee for this event? This is completely free for all the participants. Will there be any T-shirt/Jersey/Breakfast/Lunch or any other freebies? No, all participant need to bring their own food (we prefer dry food) for breakfast or may buy from nearby restaurant. We also advise to bring a bottle of water. However, we will give sometime to all participants to have their breakfast before the BIB distribution started. Shall we receive any certificate if together we break the attempt? Yes, you will. But we will provide you the certificate of participation from BDCyclists once the official announcement we receive from Guinness Team. However, this may take some time (few days to few week). We will communicate with you in due course. Shall I bring my Unicycle/Tandem/Fat bicycle? Can I use my camera(any type of) during the main ride/attempt? Once the ride has started, you are not allowed to use mobile / action camera. Using such gadget during main event is strictly prohibited. However, you can keep these gadgets into your pocket. It is better to keep your phone silent or switched off during the attempt. May I perform any stunt during the event? Bicycle stunt is strictly prohibited. I am physically not fit right at this moment. Shall I register? No. We discourage not to register if you are unfit.Riders with any kind of medical conditions are advised not to join the rides unless cleared by their doctors. My bicycle is ok but still it has some issues. Shall I register? If your bicycle is not in a condition to ride and fit, we request you to fix it and join the event. I do not have Red / Green / RED-GREEN t-shirt. Shall I join? We recommend to wear t-shirt that has either Green or Red or both. However, this is not mandatory. Can I wear Panjabi during the event? No. You need to stick a numbered bib’s on to your thigh and wearing Panjabi is not a good option. I do not have helmet, can I join? No. BDCyclists always promote bicycling with safety gears. Wearing helmet is absolutely mandatory. What shall I do if my tire got flat during the main event? You should leave the main line and park the bike in your left leaving space for cyclists at your back. However, DOs and DON’Ts will be announced into the main event several times. Shall I keep continue riding after touching the finishing mark? Yes. You should keep riding unless it is announced to stop by the event marshal, stuarts or volunteers. However, DOs and DON’Ts will be announced into the main event several times. If any company offer me any free goodies then what shall I do? This is not a sponsored event. We strongly recommend not to take freebies and help them to brand their product without permission. However, if you face any difficulties or find any brand promoting themselves, please speak to any activists / moderator of BDCyclists. What if a registered participant can't attend the event? You must inform us over phone or text (01714-454838) immediately so that we can accommodate someone to that place. This will help us to run the show smoothly. 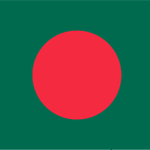 Can I bring big sized Bangladesh flag and fix it to my bicycle? We strongly recommend not to bring any big size flag and fix it to bicycle. Flag attached to pole may cause rider feeling uncomfortable to balance the bicycle and maintain single line. However, you may bring small flag and fix into your bicycle properly. 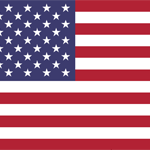 Please make sure flag is tightly fitted with bicycle and do not fall down during the ride. I have just learned cycling few days ago. Can I join the event? No you shouldn’t take the risk. It is highly recommended for the riders who have experince in riding on the street single line riding. Those who lives outside of Dhaka, when should s/he come to Dhaka? You must attend any of our rehearsal/selection ride scheduled on 9th and 13th December, 2016 (Govt. Holiday). This is absolutely mandatory for all participants. We understand that coming to Dhaka ahead of main event is sometimes difficult for you but we have no option in our hand. To adhere rules and regulations set by Guinness we need to onboard all the participant on the same boat. If you are unable to attend any of the rehearsal/selection ride on 9th and 13th December, 2016 then please let us know immediately. Can I bring my wife / kids with me (They did not register for the event)? Yes, you can but they cannot take part into the event and has to stay in the in the audience section. 16th December, 2016 is Friday. Shall we have prayer break if multiple attempt is required? Yes, there will be a prayer break. However, we will try our best to wrap up the main ride before Jummah prayer. This is why it is important to attend rehearsal/selection ride so that we can ensure smooth execution on the main event. → We recommend to bring sun cap in case it is very sunny day. We will try to finish distribution of bibs at our earliest and start the ride on time. → Bring your own water bottle with you. → Bring patch kit or extra tube in case your tyre got flat. → Please make sure your bike is 100% fine especially got enough pump and good braking condition. → Wearing helmet is mandatory, we also strongly recommend to use gloves for safety reason. → Wherever we go, we leave the place cleaner. So DON'T LITTER and carry your own trash with you for proper disposal later on. → BDCyclists will not provide any breakfast or snacks. You are advised to keep small amount of money for breakfast with you or bring of your own. → You are strongly advised not to park your bicycle unattended. You are solely responsible for your bicycle’s security. → If you got injured by any chance, please immediately inform your respective steward. We have emergency medical kit to help you. → You are strongly advised to use leg tie in your right leg so that your pant do not get trapped into chain. → Drinking water during the Guinness ride is strictly prohibited. You need to keep your bottle into bottle cage or into your backpack. → If you are identified using selfie stick/mobile phone/action camera once the ride started then you will be immediately requested to leave the event. We are extremely sorry regarding this zero tolerance rule and cannot give you another chance. We believe all of us will keep this rule in mind. It is about Guinness World Record and taking Bangladesh’s name into a new height, we will definitely remain sincere and disciplined. Note: If you still have any query, please let us know your question straight into our event page. In order to manage this event smooth and flawless, we have arranged pre-registration for all the participants. This is to inform you, we can accommodate limited number of participant and requesting you to register at earliest. Registration will follow first come first severed basis method. Please go through the below link, fill up required filled and complete the registration! PLEASE GO THROUGH THE RULES, CHECK THE FAQ, ADVICE BEFORE REGISTRATION. *It will take upto 24 hours to update the participation list. Please keep patience. You can download the official press release from here.